The summer season of the KZN Philharmonic Orchestra, in the Playhouse, Durban, closed with a bright and breezy programme of mainly Russian music, all much appreciated by a big audience. The visiting Japanese conductor Yasuo Shinozaki was again in charge, and again he invigorated the proceedings with a tirelessly energetic performance on the podium. He must be exhausted, somebody said to me afterwards. Yes, and he gets the results. The soloist was the 31-year-old Russian violinist Andrey Baranov, who had created a great impression the night before when he played for the Friends of Music. He displayed his full range of skills in the Violin Concerto in A minor by Alexander Glazunov. Written in 1904, this is a late romantic concerto, not one of the great works but impressive and melodious. The solo violin has a virtuoso role, and this was brilliantly delivered by Andrey Baranov. The greatest of all Russian composers, Pyotr Tchaikovsky, was represented by his Symphony No 2 in C minor, nicknamed the Little Russian, this because it contains folk music from the Ukraine, which used to be called Little Russia. It is typical Tchaikovsky, full of good tunes, vividly orchestrated, varied and never dull. The orchestra were in splendid form, with some particularly notable contributions from the brass players. 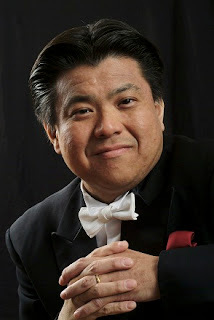 Yasuo Shinozaki conducted with great commitment and vigour, and the end there was an excited ovation from the audience. The concert opened with a spirited account of the bright and witty Beatrice and Benedict Overture by Hector Berlioz.